“I didn’t start to make a record. I just had no other options. I didn’t know what to do with my time. I started playing piano and out of the few things I had written down on scraps of paper started to record little songs in the basement thinking ‘well, I’m gonna get off my deal and maybe I’ll sign another.’ I wasn’t sure whether I was gonna make another record or not. This is the only record I could have made even if I wanted to make a more upbeat or more rocking record, I didn’t physically, mentally have it it in me to make another record. So, I was encouraged to sort of follow this muse by Gary [Gersh, then CEO of Capitol Records] who signed me at Capitol. And it was great because it’s what I wanted to hear. It was where I was at. 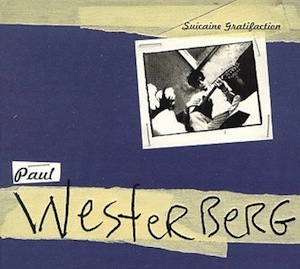 Some of the labels heard my stuff and were very pleasant but were looking for upbeat dance hits…it’s not what I do and it’s nice to know there’s an audience, at least on the industry level, for what i do.” – Paul Westerberg, from Ondi Timoner’s documentary on the making of Suicaine Gratifaction. But almost a year after signing to Capitol, and only eight months before the release of the album, a funny thing happened on the way to a record. Gary Gersh left Capitol Records and, thus, so did Paul’s A&R representation. So did, it seems, any real interest in Paul’s work. The album wasn’t promoted heavily and would rise to its highest place on the Billboard album charts, 104th, in mid-March of 1999 on its way to total sales of only about 52,000 copies, 2/3rds of the sales of Eventually. Within a year, Westerberg and Capitol would part ways, putting an end to his last tenure to date with a major record label. The instruments on this record, not to mention the backing vocals, were provided by a heady array of well-known musicians. In addition to Don Was’ contributions on bass, Shawn Colvin and Dave Pirner sang backing vocals (“Born for Me” and “Fugitive Kind,” respectively), and Benmont Tench, Greg Leisz and Josh Freese, among others, filled in on instruments. But this bevy of studio craft has an up and a downside. The record is nothing if not impeccably recorded, but this has the negative tendency to buoy songs that aren’t that solid to begin with. Despite its clever title and lyrics, “Best Thing That Never Happened” has no business going on a full four and a half minutes. “Final Hurrah,” another weak track, has its flaws similarly hidden by the production. Even the seemingly lovely “Sunrise Always Listens” finds itself lacking after a few listens. The excellent production also, however, sends the bulk of the record, chock full of mostly excellent songwriting, well up the scale. Perhaps this is the production that the over-cooked Replacements album Don’t Tell a Soul, similarly plagued with a handful of cast-offs and mostly solid songs, could have used. “Best Thing That Never Happened” finds its antithesis in the track immediately after, the rocking “Lookin’ Out Forever,” which comes in at just over three and a half minutes and includes an invigorating and economical guitar solo to boot. The whimsical and clever “Tears Rolling Up Our Sleeves” and “Whatever Makes You Happy” are both vintage Westerberg, their playful and mocking puns and imagery a trademark of his best work. Even “Fugitive Kind,” a song that would seem far too long at nearly six minutes, manages to stay engaging and fun. In revisiting this album and listening to it all the way through for the first time in awhile, I found myself singing along rather vigorously to that song, a tune I’d long ago dismissed for its overlong runtime. “Ain’t got time for you to grab your stuff. / What’s flowing through our veins is good enough” is one of those purely Westerbergian turns of phrase. Great piece. I really hope Suicaine Gratification and the two previous solo albums get released on vinyl one day. Will always love the Mats and Westerberg. Cheers. I loved seeing this in my newsreader this afternoon. I’m a big fan of Suicaine though I resisted buying it for a long time. I think it was probably the album he needed to make at the time. So delightful to see this in my reader, as well today. I’ve been on a major Mats/Westerberg kick lately and it’s really refreshing to see someone who can appreciate those legends as equally and write such a tasteful and devoted piece. Well deserved. Very well said. This record will always strike a cord with me. Soon after Suicaine came out was about the same time in my life in which I decided to grow up, propose to my girlfriend, and get some sort of a decent job. The record kinda fit, such as most of Paul’s records, to a certain time in my life. I think that is what makes him so great and mean so much to me. Excellent, great piece. I’ve never really spent as much time with this record as I should have, being a huge fan of The Replacements and most of Westerberg’s solo work. Fantastic piece of writing to help to possbily explain where Westerberg was at the time he recorded SG. Long Live Paul. P.S. AD is absolutely killing it of late! Piling on… beautifully written appreciation, man. Not to be a complainer, but I would like to know more about the documentary. Title, is it released, etc.? @Dean – The documentary, Seeing Through Paul, was shot as a promotional item for Suicaine Gratifaction but was never officially released. It’s hard to find full copies of it on the web streaming anywhere, but you can find clips. Here’s a link to part of it over at Dailymotion and the link to the second part they have is there as well. They have about 13 minutes total, which is only about half of the total documentary from what I’ve heard. Bootleggers trade copies of the documentary, but that’s about the only way I know of to see the whole thing. Ondi Timoner, the director, is also famous for doing the Dandy Warhols/Brian Jonestown Massacre documentary Dig! Great article. @J.Neas, Thanks for the explanation. I’m looking forward to the new Replacements doc. Anyone else? While I will always love Paul’s solo stuff, I’m partial to the band era. COLOR ME OBSESSED screens on Saturday, March 26th at 7:30 PM at the Gasparilla International Film Festival in Tampa, FL. On Saturday, April 2nd at 6:45 PM at the Wisconsin Film Festival in Madison, WI. On Friday, April 15th at the Chicago International Movies & Music Festival in Chicago, IL. And on Wednesday, May 4th in Minneapolis, MN as a special presentation of Sound Unseen’s monthly screening series. Very good article BUT “Final Hurrah” is not a weak track – it’s a fantastic tune. And where’s this Ondi Timoner documentary? Never heard about such a thing until this article. I never understood the Stereo hype. To me, this one (and the grandpaboy ep) were his return to form. Suicaine sounds like the stuff he’s doing now with better production.